Merlin Fireworks have gained a worldwide reputation for presenting spectacular International Firework Displays. Our team are experienced at working Internationally for major National Celebrations and functions in the Middle East, Africa and Europe. Some of our past projects include the Jounieh International Festival, the Lagos Countdown, Opening and Closing Ceremonies for the European Capital of Culture in the Republic of Ireland, Kuwait’s Anniversary of Liberation, Nigerias 50th Anniversary of Independence and New Years Eve Celebrations in Gibraltar. 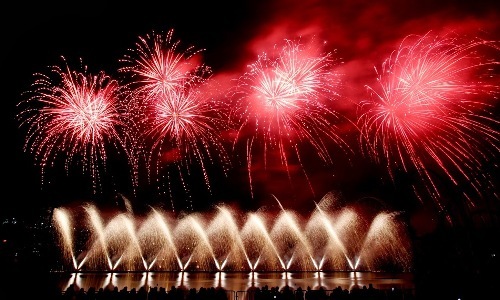 Merlin were proud to have participated in two of the Worlds largest and most prestigious International Firework Competitions, The World Fireworks Championships 2010 in Oman and the L’International Des Feux Loto-Québec 2013 – Montreal. With increasing regulation surrounding the transport of explosives, sending Fireworks around the World can be a complex undertaking. Fortunately Merlin have the expertise and excellent contacts for the transport of explosives by seafreight and airfreight. Give Merlin Fireworks a call on +44 1794 389111 if you would like to discuss holding an International Firework Display.